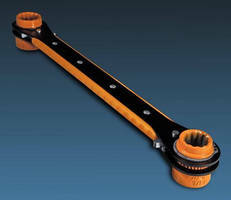 Available in handle lengths from 8–60 in., cast iron Series 50 features fully enclosed ratchet mechanism, whileÂ stamped steel Series 150, offering handles lengths from 10–15 Â¼ in., has partially enclosed mechanism. Square socket sizes range from 5/8–4 Â¼ in. for 50 Series and 5/8–1 5/8 in. for 150 Series, while hex sizes range from 5/8–9 1/8 in.Â for 50 Series and 5/8–1 5/8 in. for 150 Series. Equipped with quick release, Series 50QR enables users to change sockets with flick of thumb. WEST BOYLSTON, MA – Lowell Corporation offers the 50, 50QR, and 150 Series of ratcheting socket wrenches that are designed for tough construction and pipeline jobs. Those who need a heavy duty wrench but do not want to buy an entire socket set can now buy individual wrenches with just the socket sizes they need, square or hex, inch or metric. Applications include guardrail, dock, and scaffolding assembly, heavy equipment adjustment, container leveling, band tightening on wooden barrels, pipes, and water towers and pipeline installation and repair. The Series 50 wrenches are cast iron while the Series 150 wrenches are stamped steel. The two differ further in that the ratchet mechanism in the Series 50 is fully enclosed while the less expensive 150's mechanism is partially enclosed. Also the heads of the Series 50 disassemble for cleaning while the 150 heads do not. 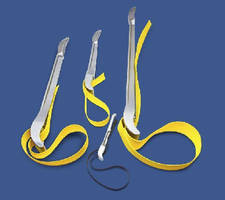 The Series 150 tools are also available with a large easy-to-use shifting mechanism and an ergonomic comfort grip. Handle lengths range from 8"–60" for the 50 Series and 10"–15-1/4" for the 150. The two series are similar in performance. All models have the company’s Bolt-Thru design that allows bolts to pass entirely through the wrench head so that nuts can be secured on any threaded length. All wrenches also have a reversing control located in the head to reverse the action safely and conveniently. Sockets for the 50 and 150 Series are available in square or hexagon shapes. Square sizes for the 50 Series range from 5/8” to 4-1/4” and from 5/8” to 1-5/8” for the 150 Series. Hex sizes range from 5/8” to 9-1/8” for the 50 series and from 5/8” to 1-5/8” for the 150 Series. Corresponding standard metric sizes are also available. Series 50QR models feature a quick release that enables users to change sockets with the flick of a thumb. Sockets are held securely in the handle with a sure-locking dead bolt. On other models, a retaining ring is easily removed for socket replacement or changeover. Like all of the company’s products, Lowell’s Series 50 and Series 150 ratcheting socket wrenches are guaranteed against defects in material and workmanship for a period of one year from date of delivery. For more information about Lowell wrenches or for a full-line catalog, call 800/456-9355 or 508/835-2900, visit the company’s web site: www.lowellcorp.com, or email customerservice@lowellcorp.com. 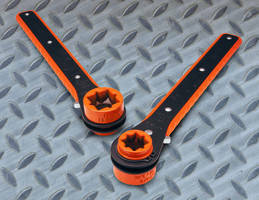 Linemen's Wrench makes work easier and safer. 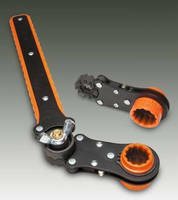 Lineman's Wrench features 6-in-1 design. 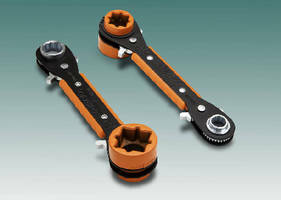 Double Sided Wrenches feature 200 lb-ft torque capacity. 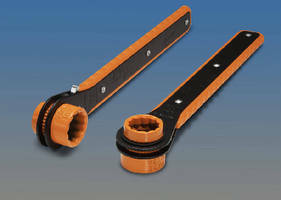 Ratcheting Socket Wrench offers 4-in-1 functionality.